Why two JUN Cultures? Each culture is for a 1-Gallon Batch the first time. So if you want to make a 2-Gallon Batch right away, or make Two 1-Gallon Batches right away, or want to start a JUN Hotel and a Batch Brew, or if you want one for a friend/family member...there are so many reasons to want 2 SCOBYs!! 100% Real RAW Honey grown in Texas, USA. 8oz per gallon of JUN recommended, stock up at a discount by selecting from the drop down menu! If you need a high quality glass vessel for Batch Brewing or even a Hotel, we've got you covered. The included thermometer strip(s) offer convenience and accuracy and will stay attached once applied, even through the dishwasher. The strips let you know if the brew is in the right temperature range for brewing success, or if a heating solution may be needed. 70-80°F (21-27°C) is the best range, 75°F (24°C) is ideal. Add 2 jars and you will receive 2 thermometer strips plus an extra Hand-Cut Cloth Cover and rubber band for the second jar. 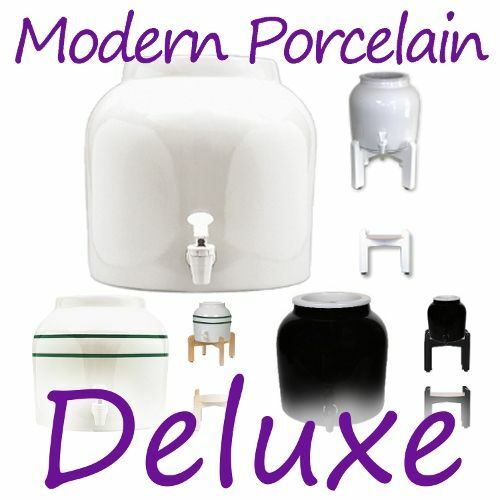 Each delivers the same great power, so select based on style and ease of use. From our manually controlled Essential Heat Strip to the dimmer control of the Year Round Heating System to the full thermostat control of the Ferment Friend, all are fully guaranteed and will warm up to a 2.5 gallon brew. Or you can wrap them around/between 1, 2 or even 3 regular gallon jars at a time (see the video below). The #1 Kombucha resource in the world with instructions for mastering Batch or Continuous Brew plus flavoring, troubleshooting, history and everything else you could ever want to know, offered at a discount! Most information applies to JUN as well, including all the recipes! 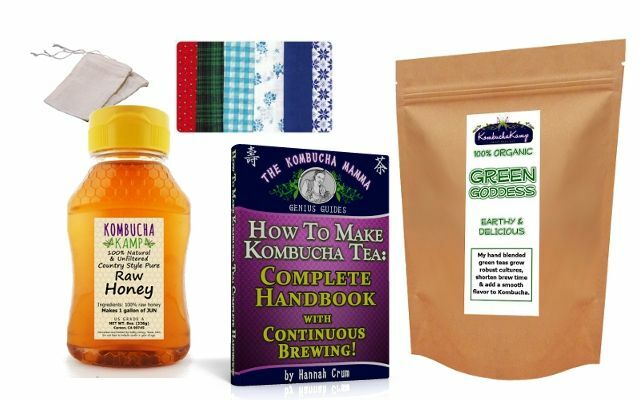 Very useful for JUN or Kombucha brewing! Buy this high quality 100% Raw Honey JUN Tea Kit with free shipping and a brewing guarantee! Authentic JUN Tea Cultures from Kombucha Kamp are grown using only 100% organic and real RAW Honey. Watch out for cheap "honey jun" cultures made from pasteurized honey and regular Kombucha cultures. These genuine JUN Cultures thrive on RAW honey only and prefer green tea, though other tea blends will still brew. When using this culture, all future batches should be brewed with raw honey, so be sure you have a good supply of local real raw honey or you can add bottles to your order, 8oz per gallon is recommended. These high quality JUN Cultures create an authentic brew and have been cultivated exclusively by Kombucha Kamp for many years, so you can buy and brew with confidence. Plus you can customize the kit to include additional cultures, USA made glass jars for brewing, heating elements, and more! CLICK HERE to learn more about JUN Tea at our blog. Web & Client email preferred support - Facebook, KommUnity, Forums, E-mail: pick your favorite way to get answers and we'll be there to provide them! 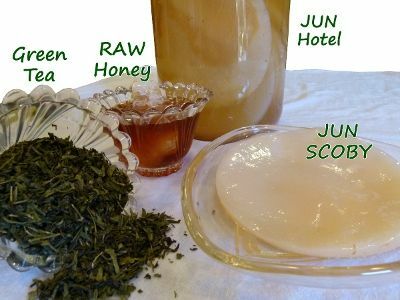 Add a 2nd JUN Tea SCOBY for only $20! - Why two SCOBYS? Each culture is for a 1-Gallon Batch the first time. 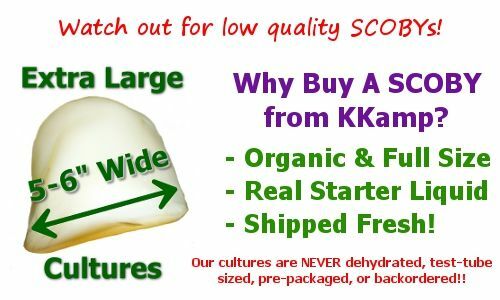 So if you want to make a 2-Gallon Batch right away, or make Two 1-Gallon Batches right away, or want to start a JUN SCOBY Hotel and a Batch Brew, or if you want one for a friend/family member...there are so many reasons to want 2 JUN Cultures!! Add a USA Made 1 Gallon Glass Jar...or Two! 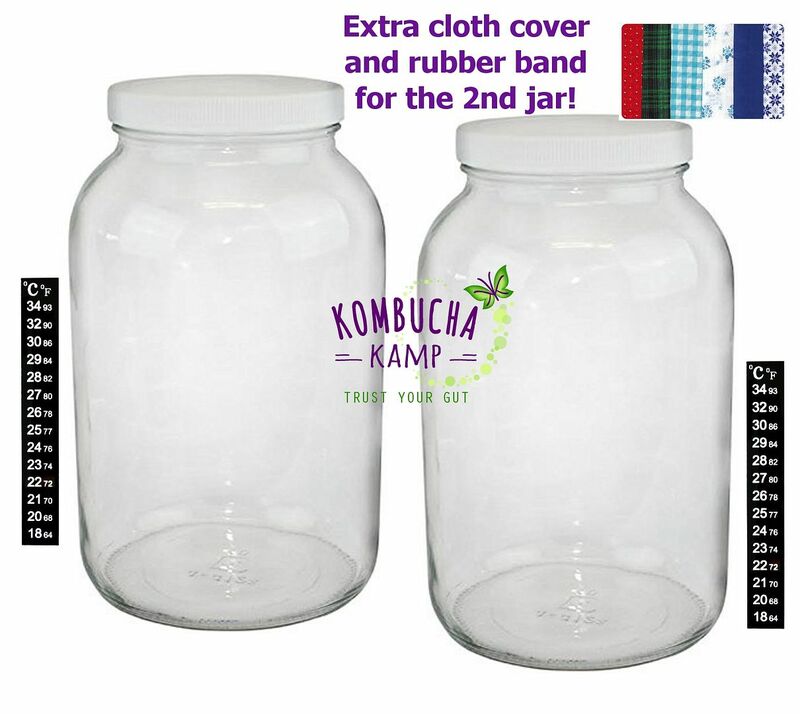 FREE Thermometer Strip(s) and an extra cloth cover for jar #2 make this a great value, all with FREE SHIPPING! (in the USA) - If you need a high quality glass vessel for Batch Brewing or even a Hotel, we've got you covered. The included thermometer strip(s) offer convenience and accuracy and will stay attached once applied, even through the dishwasher. The strips let you know if the brew is in the right temperature range for brewing success, or if a heating solution may be needed. 70-80°F (21-27°C) is the best range, 75°F (24°C) is ideal. Add 2 jars and you will receive 2 thermometer strips plus an extra Hand-Cut Cloth Cover and rubber band for the second jar. 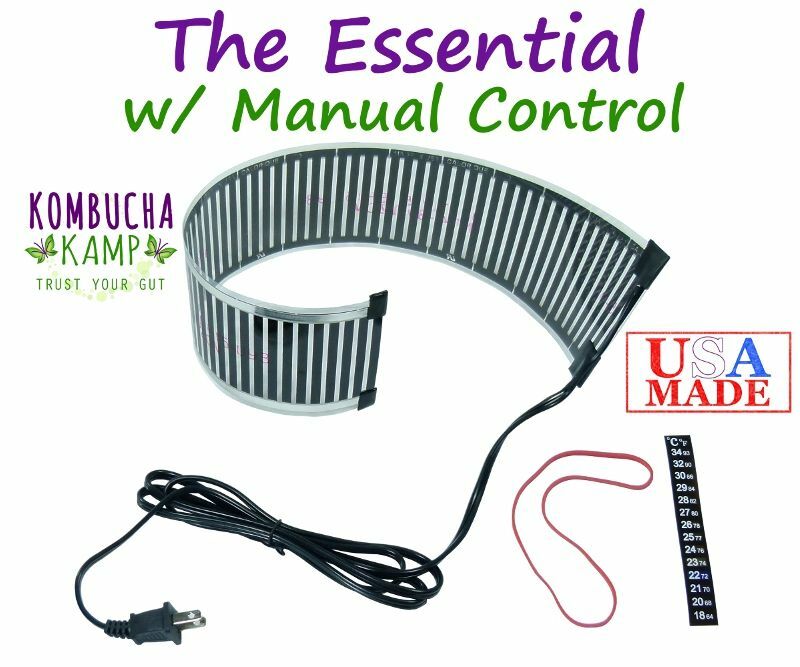 Add a high quality Kombucha Mamma Heating Solution - Each delivers the same great power, so select based on style and ease of use. From our manually controlled Essential Heat Strip to the dimmer control of the Year Round Heating System to the full thermostat control of the Ferment Friend, all are fully guaranteed and will warm up to a 2.5 gallon brew. Or you can wrap them around/between 1, 2 or even 3 regular gallon jars at a time (see the video below). 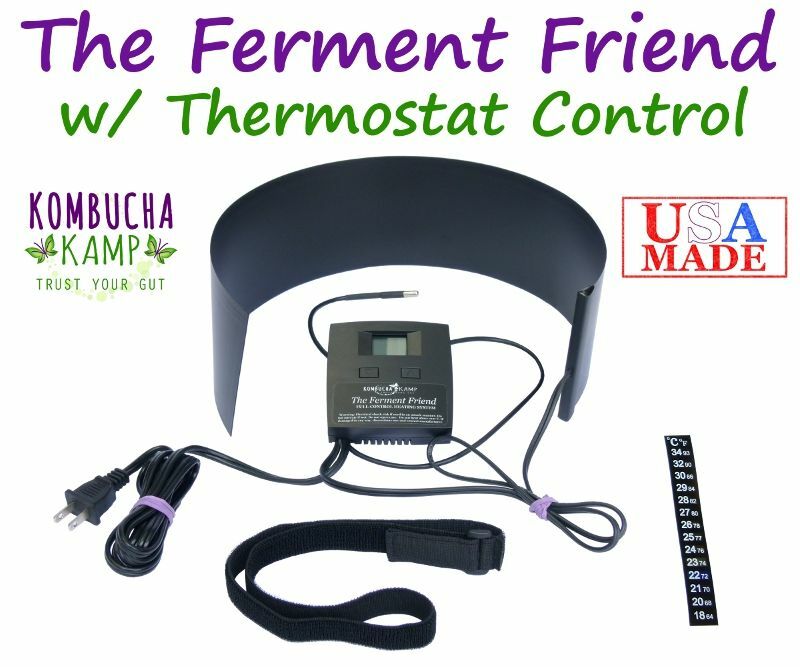 For additional info on each model, click the product link above or for more info on heating Kombucha and all the models, click here. 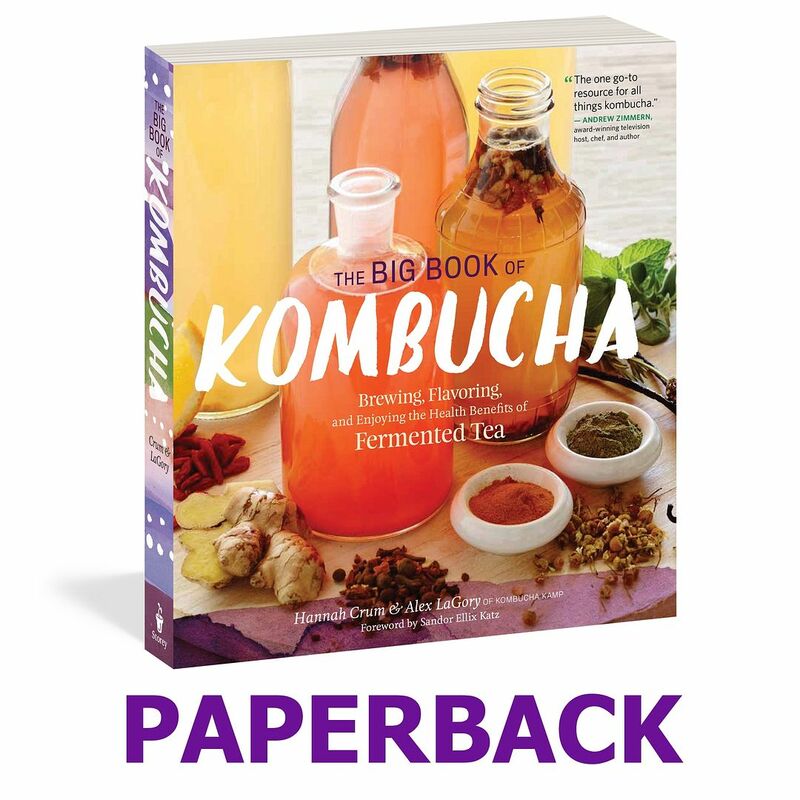 Add The Big Book of Kombucha - The #1 Kombucha resource in the world with instructions for mastering Batch or Continuous Brew plus flavoring, troubleshooting, history and everything else you could ever want to know, offered at a discount! While this book is written for Kombucha, the majority of the information applies. 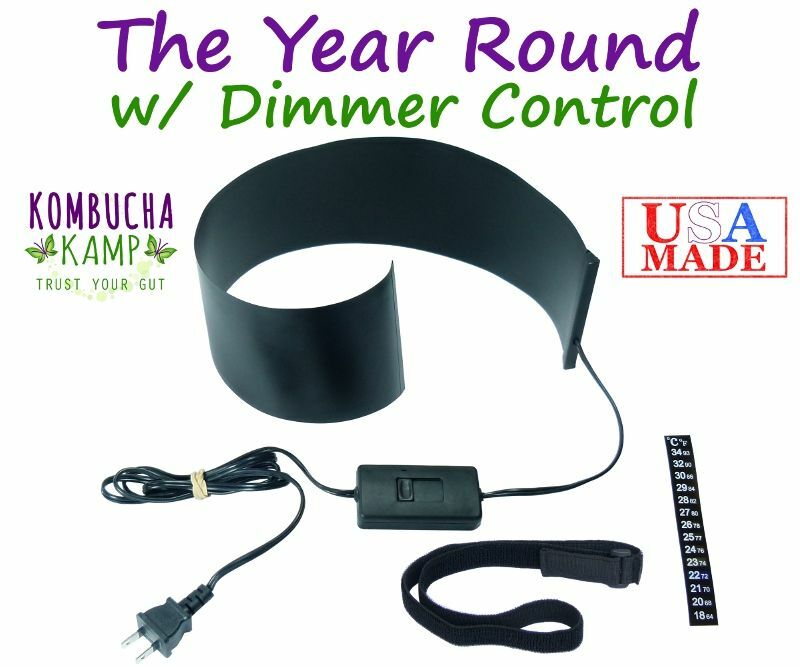 Very useful for both JUN and Kombucha brewing! While dehydrated SCOBYs may produce a safe batch of JUN Tea, they are VERY SUSCEPTIBLE TO MOLD. The living culture at the center of a dehydrated SCOBY cannot properly protect itself early in the brewing cycle without the full power of the culture and starter liquid (included with your Kombucha Kamp JUN Culture). Water is the source of all life on Earth. Why begin your quest for a healthy LIVING beverage with a bone dry culture? Test tube size? That's a joke right? Unfortunately, no. There are test tube size SCOBYs and even SCOBYs the size of a half dollar, requiring multiple batches to get up to full brewing potential. Unsuspecting consumers are duped everyday by these sellers. The worst part is that many new brewers give up, thinking they have done something wrong. It's not you, it's your starter culture! What's a "Fresh Kombucha Culture" mean? 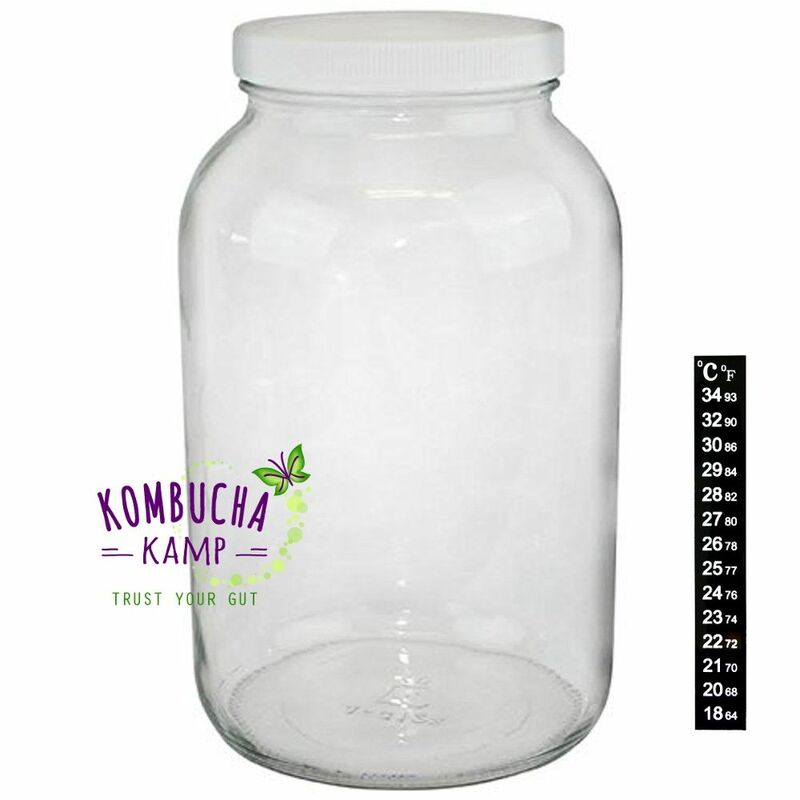 Every Kombucha Kamp culture is grown in it's very own jar till it's thick and creamy, then harvested to a SCOBY Hotel and stored for shipment in strong starter liquid. There is no wait for a SCOBY to grow, it's never been dehydrated, nor has your SCOBY been sealed in a box for weeks. Fresh means your culture is ready to brew on arrival, that's the Kombucha Kamp guarantee. before investing your money in their product. I can't express how impressed I am with this kit. First of all this Jun culture is the best one available on the internet without question. 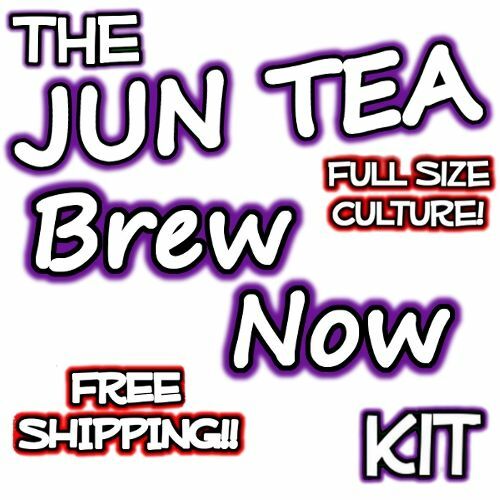 Full size and ready to create amazing jun right from your first brew! Not a tiny little scoby that will need multiple brews to grow to maturity. I was also so impressed with the tea that I purchased a lb. and will continue using it in the future. Since purchasing this kit I have ordered a second jun culture and vessel since my friends keep drinking all of my batches!!! There is no store bought product that will come close to what this kit will create for you and it is very easy to do. I'm hooked! I had recently moved and my Jun SCOBY hotel had suffered in the transition and molded. I was heartbroken. I friend had turned me on to this site but Jun SCOBYs weren't an option when I went to the website. Now they are and I am back in business! The kit is great - I got a brand new Jun SCOBY that has already produced one batch and is working on the next, the heating strip is a god-send in my tiny house with no insulation, and the book has given me great ideas about playing with flavorings. My order didn't originally come with the strip but an email to KKamp quickly resolved that and I had it within two days of my email. I am very happy with purchase and will be purchasing a jar cover and cap in the near future. Thank you, KKamp, for getting me back on track!